Lotto nl says: "walk over to a western union outlet and make the payment"
Hello, I am Miss Young. received this story from a friend. Let me call him Peteh. Peteh won in the lottery: Go to the homepage to see more stories. RE: 30 Years Anniversary Awards! We are celebrating our thirtieth anniversary this year and to mark this special occasion we are launching our first international program, The 30 Years Anniversary Awards! To make it special Lotto nl is giving away Thirty million Euros. We intend to make thirty families millionaires this year with our 30 Years Anniversary Awards program. We want to make this year special for you and all the more memorable by giving you One Million Euros! Yes, ? 1, 000, 000, 00. From the results of the 30 Years Anniversary Awards draw that took place on the 9th of January 2006. Lotto nl is proud to announce, that you have been chosen to receive ?1, 000, 000, 00 in our 30 Years Anniversary Awards promotion. Winners are selected via their email address and your email has come out as one of the winners. With this we say CONGRATULATION$. This is an independent promotion and is unconnected to any publication. No purchase necessary. Any entries without valid collection numbers will be declared void. All winnings must be claimed not later than the 25th of January 2006. After this date all unclaimed prizes will be declared void. Claimants must be over 21years. All entries must adhere to the 30 Years Anniversary Awards eligibility/claim rules stated in our official rules. You will receive the 30 Years Anniversary Awards!' claim rules when you file your claim. This program is strictly for international participants and all Dutch residents are exempt from participation. NOTE: Being that you were selected via your email address and to avoid double claims your winnings must be notarized and a certificate of award must be obtained from the Netherlands Gaming Control Board to complete the claims process, this certificate can only be obtained through legal representation, so you will be referred to an independent lawyer acting as a referee to assist in this process. The notarization is essential to create a legal link between you and your email address. You are responsible for the legal charges for the notarization of the claim and the acquisition of the certificate of award. Kindly remember to quote your reference number in all correspondence. Finally, we call on you to make sure that you save a copy of this mail because you might be called upon to produce it at anytime and do note your reference numbers clearly as stated for we will not be held responsible should there be any complications in this transaction due to negligence on your part. Congratulations once more from all of us at Lotto nl and thank you for being part of our promotional program. 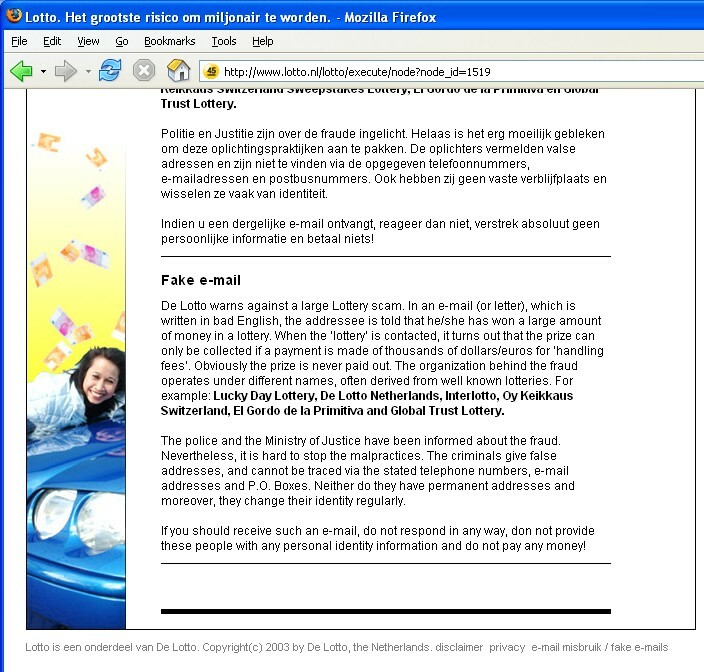 NOTICE: You have received this message from lotto nl prize dept. because you have visited one of our sponsored sites and have voluntarily given your email address to receive mails from their sponsors.If you wish to be taken out of this list do not reply to this mail, reply to the agent with the words remove. If you are not the intended recipient, you must not, directly or indirectly, use, disclose, distribute, print or copy any part of this message. If you believe you have received this message in error, please delete it and all copies of it from your system and notify the sender immediately by reply e-mail. Thank you. We the entire staff of Lotto nl wishes to congratulate you for being one of the lucky winners in this lottery promotion. This is an independent promotion and is unconnected to any publication. No purchase necessary. You received the winning notice because you have visited one of our sponsored sites and have voluntarily submitted your email address to receive mails from their sponsors. All winnings must be claimed not later than the 25th of January 2006. Any entry without valid collection numbers will be declared void. Any entry late, lost or tampered with will be declared void. Please ensure that you retain a copy of your initial letter and the game rules (Winners may be asked at any time to produce letter) Upon completion of the claim, your documents will be checked and we will endeavour to deliver your award within 5 days. The forms must be properly filled out. Any wrong information provided will result in automatic disqualification. All winnings must be registered with The Netherlands Gaming Control Board (College van toezicht op de kansspelen). And by order of the N.G.C.B. all winnings must be notarized here in The Netherlands. The N.G.B.C. will issue a certificate of award in acknowledgement of the win. At this point, it is pertinent we emphasize that under no circumstance whatsoever does Lotto nl charge any kind of fee or request for any amount of money from winners to process their claim. Whatever monetary commitments that may be required from winners are done at the sole discretion of the attorney that winners are referred to for assistance and all negotiations of such shall be between the winner and the attorney, without any intervention from Lotto nl. Winners will be referred to an independent attorney here in the Netherlands to have their forms notarized in order to obtain the Certificate of Award from the Netherlands Gaming Control Board. (This attorney will act as an arbitrator and is not under our payroll) As the winner you are responsible for the legal charges (� 550). These charges are nondeductible. The notarization and acquisition of the certificate of award completes the claim process, failure to do so will cause you to forfeit the prize. A double claim will nullify your winnings. Your funds have been placed in an escrow account pending the completion of your claim process. For security reasons, all prizes have a hard cover insurance making it impossible to withdraw anything from it before it is transferred to the winner. Note also, that you are not obliged in any way to claim this prize award and you have every right to reject it, this does not affect your statutory rights. Employees and their relatives are excluded from participating in this program. You are obliged to have your name published as a winner. To be eligible for claim you must complete the claims process before the deadline stated in the winning notification you received. Filing a claim means acceptance of the full game rules of Lotto nl. Once you are sure you understand these conditions of the 30 Years Anniversary Awards claim rules, reply to this mail stating that you wish to proceed to claim your prize and we will provide you with the forms to start processing your claim. You are to fill the forms (Claim form and Payment scheme form) and send it to the appointed lawyer (Details will be sent with forms) for the notarization and acquisition of your certificate of award from N.G.C.B. When completed Lotto nl will approve it and transfer your prize to you through whichever method you indicated on the payment scheme form. You must understand that you were selected for this draw through your email address, so the notarization process is vital because with this we can create a link between the lucky email address as well as the winning details to you. Without the notarized forms the N.G.C.B. will not issue the certificate of award which makes you legally entitled to the funds and without this you have no legal claim on the funds. This process will also enable us to checkmate double claiming. However, be informed that failure to fill the form properly will result to the cancellation of your lottery winning. Note: The claiming process must be completed before the deadline. The expiration date is stated in the winning notification you received. NOTICE: This message, including all attachments transmitted with it, is for the use of the addressee only. It may contain proprietary, confidential and/or legally privileged information. No confidentiality or privilege is waived or lost by any mistransmission. If you are not the intended recipient, you must not, directly or indirectly, use, disclose, distribute, print or copy any part of this message. If you believe you have received this message in error, please delete it and all copies of it from your system and notify the sender immediately by reply e-mail. Thank you. I thank you for notifying me as to the winning. I will fill the rest of the form and forward it to your attention in due course. As i already have a Lawyer (Solicitor) in the Netherlands i will appoint him to be my notary agent because he handles all my business transactions in Europe. I just have a simple question though. Will the cheque of � 1, 000, 000, 00. be paid as 1 cheque or can it be in 10 cheques of � 1, 000, 00, 00. (hundred thousand euros). Due to tax implications i was hoping that the payments be in in the form of 10 separate cheques and mailed out to my separate business addresses throughout the European Union. I will instruct my Solicitor to pay any additional fees to your organization for this special service. Please confirm if this is possible and i will initiate the process. I thank you in the meantime. Congratulations, we have received your consent to be registered as an applicant in our data base and your agreement to the game rules of Lotto nl. We wish to congratulate you on this decision. Attached to this mail are copies of the claim forms, print out, fill in properly indicating the mode of payment you prefer. You are to contact your appointed lawyer to notarize your forms register your win and acquire the certificate of award from the Netherlands Gaming Control Board. After this process, your certificate of award and your notarized forms will be forwarded back to us for confirmation. Your prize will be transferred to you after the confirmation. Yvonne M. van Boxel Advocaat. When calling from the US or Canada, replace 00 with 011. Your application for the claim of your lottery winning will be duly processed and settlement be made upon completion. Therefore, carefully fill in the appropriate information in the spaces provided below IN CAPITAL LETTERS and return this form to us as email attachment or fax to facilitate our immediate processing of your claim. SUBJECT: Notification of Winning Approval. Please confirm if i will get 1 million Euros or 1 million US$. There seems to be a huge variation due to exchange rate. Re: Notarization & Award Certificate. This is to inform you that I have received your claim forms. I have been assigned to assist you notarize your winning and obtain your certificate of award from the Netherlands gaming control board. In my contract with De Lotto, you, the winner is to cover my charges of Five Hundred and Fifty Euros for the notarization. Upon payment of my fee, my job is to take your forms to court for the notarization and also to the Netherlands gaming control board to register your win with them in the process obtaining your Certificate of Award from them (Netherlands Gaming Control Board) (College van toezicht op de kansspelen). When completed your legal documents will be forwarded to the payment department of De lotto for approval and they will instruct the bank to remit your prize to you. Given the time restraints I suggest that you cover my charges by Western union money transfer services. How to Send Money through Western Union. 1) Before sending any money, remember that it is Five Hundred and Fifty Euros I have to receive. Visit www.xe.com to know the equivalent in your currencey. 2) Locate the Western Union Agent in your city. You can do this by going to Western Union website and do a search on Country then City (http://www.westernunion.com). 3) Go to the nearest Western Union Agent's Outlet and fill up a Send Money Form. Mark is the firms accountant, all my monetary transactions go through him. 5) Inform me of the Money Transfer Control Number and your Name and Address. 6) On receiving money transfer control number I will go ahead and notarize the forms and get the award certificate for you. In order to expediate the process and impending week-end and time difference between Europe and USA i have decided to use the "Wire Transfer" option. I have an appointment with my bank manager for 9:00 A.M. (our time) 4 P.M your time. The transaction will conclude in 15 mins and you should have the 550.00 (Five Hundred and Fifty Euros) wire transferred. As per the bank manager the bank will require the account number , transit number, sort code of the recepient. Please furnish this detail by return email and we should be on our way. P.S. Your Website indicated that you accept payments in the form of Wire Transfers as well as Credit Cards. You have the details to cover my charges via western union, it is the end of my fiscal year and my accounts are in the process of being auditted therefore I cannot receive anything at the moment, I canot say how long this will last so I suggest you send the charges as instructed via western union to my accountant Mark Jones. I have already given approval to my bank manager to proceed with the wire transfer. The monies have already been deducted from my Bank Account. I only need your banking information and the wire transfer will be concluded. I just have to forward your email to them rather than call them. Awaiting The Banking Information by return email. I have already told you to make the payment via western union through my accountant Mark Jones. You are wasting time with this tug of war. If you are really ready you have the instructions to cover my charges the ball is now in your court, so go over to you bank or an atm machine and get the money out walk over to a western union outlet and make the payment. Get the money out from my bank account or use the ATM machine and walk over to the nearest Western Union and transfer the monies for your fees. I don't think the balls in my court. I wasn't born yesterday because my mother is still on her feet rather than be in a hospital with all the doctors trying to extricate me with the biggest forceps in the world. Just because i had some spare time i decided to waste your time so you won't try to defraud some other unsuspecting poor victim. This is not a tug or war but confrontation and i'm sure some people will read about our dialogue soon. I would like to thank you for spending your valuable time with our back and forth emails. I loved it. Thanking you in the meantime. Peteh chose to stop here.